With my favorite season (AUTUMN!) here, apples, autumn-ness, and all-things-cozy are totally worth celebrating. I couldn’t be happier. And lately, when I have time, all I wanna do is bake. So recently I was at the grocery store, saw a ton of apples, and I was like “…out of my way people…this girl’s ready to make an apple pie from scratch.” Both my eyes and shopping cart were directly targeting a display of beautiful Granny Smith apples. I love those moments. When it comes to what I want to make/bake/order I’m usually SUPER indecisive. But when I have those rare moments of knowing exactly what I want to make, watch out! My excitement and shopping cart are on a mission. Use a food processor, preferably larger than mine (I had to run two cycles of the flour/almonds/butter combo since it all wouldn’t fit!) to grind the almonds first, then add in the flour. Meanwhile…the butter cubes that you’ve previously chopped up should be VERY cold…like, they should’ve been in your freezer for at least 10-15 min or so. Then add in the butter cubes as well and pulse that all together in the processor. I got this fancy little kitchen tool from Target! Wohooo! It’s specifically for homemade pie crusts. 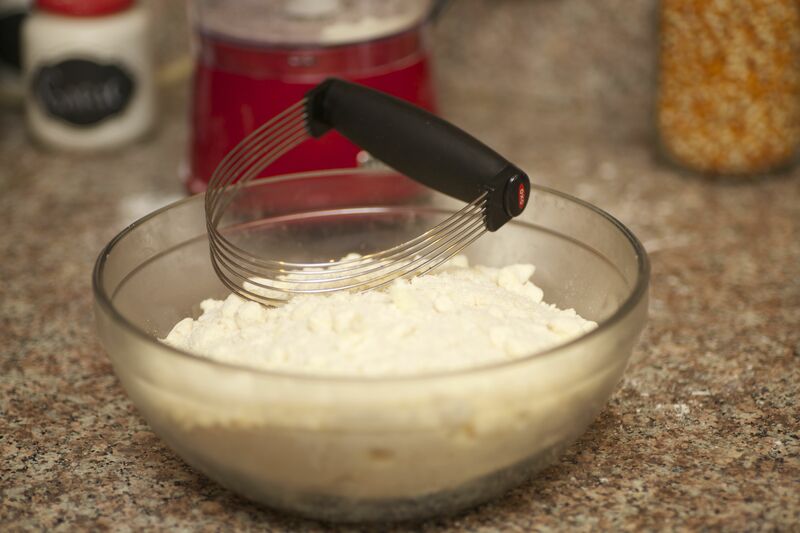 Use this to carefully mix the dough by making rolling motions with the mixer. Roll straight through the dough from one side to the other. 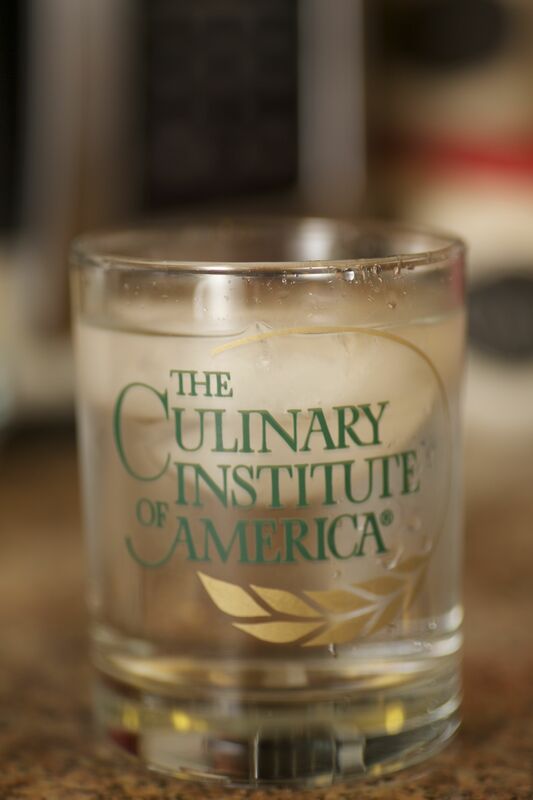 Slowly add in the water as you go…and oh my goodness would you look at that…what the heck are the odds that I’d have a Culinary Institute of America cup for this little demo!? 😉 Anyway, add one tablespoon of ice water at a time. You want the dough to really hold together, but not be too sticky, so 4 tablespoons was enough for me. After a while, it came together pretty well with the mixer, but then I just got in there with my hands to mold the dough a the end. 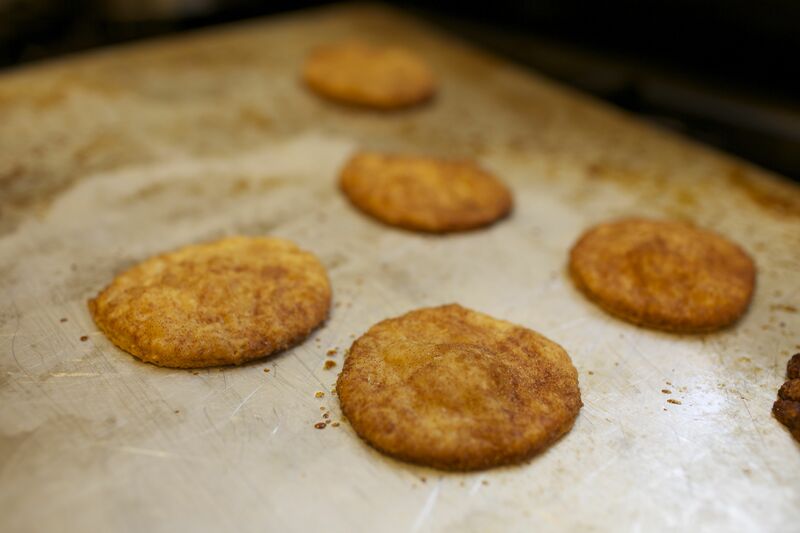 Once the dough looks like this bad boy, it’s time to place it in the freezer while you prep your apple slices. Freezing the dough will help to keep it nice and flakey once it’s cooked. 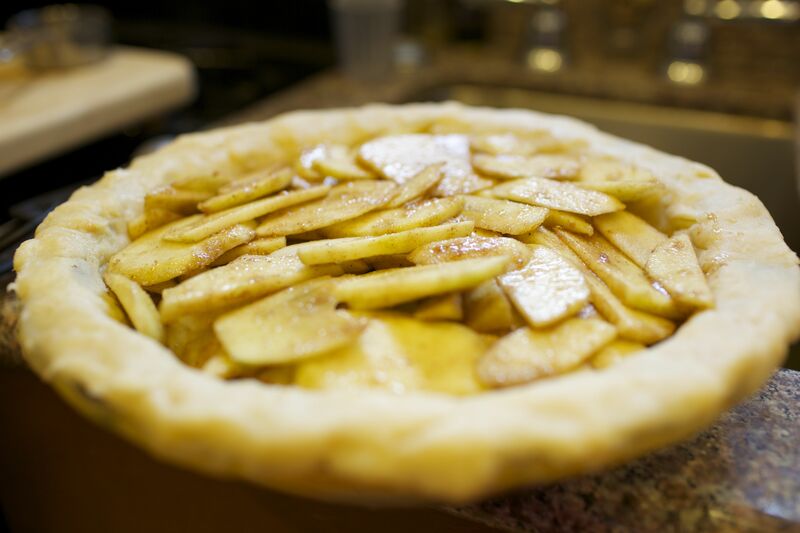 I used about 5 Granny Smith apples for this pie. You’ll need to first peel them, then chop them up into thin slices. This part takes a while. If you need a little background ambiance, put on a little sassy/classy/fun cooking music! I usually do that, but instead I had Sean’s voice both yelling and cheering at the TV while he watched a Redskins game. Always entertaining! Add all of the dry ingredients to a large bowl, then add the apple slices and mix it all up. Even pre-cooked it just smells SO yummy!!!! Set the apples aside and take the dough out of the freezer. You’ll want to cut the dough in half since you’ll use half for the base, and the other half to cover the pie. I forgot to do this until after I began to roll it out. Silly Kath. Whatever! Once it’s in half, roll out one side of the dough using plenty of sprinkled flour as occasionally as you need for it not to stick to the surface. 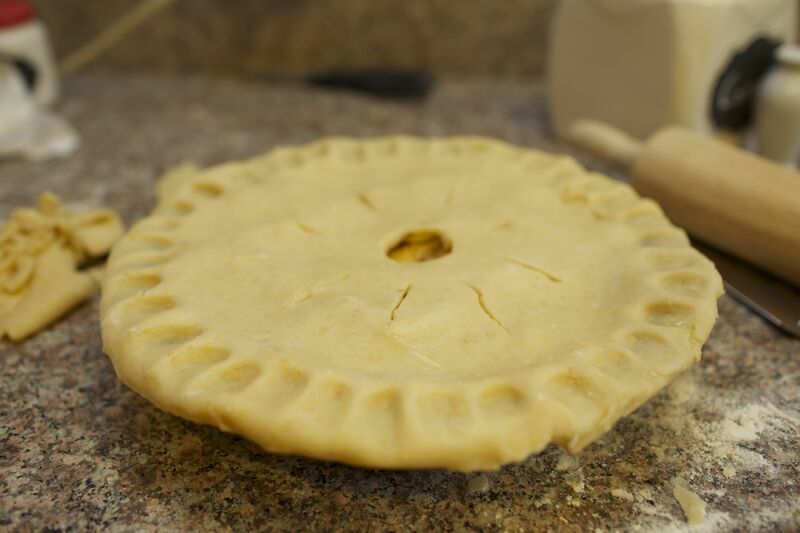 Roll it out so that it covers the pie pan – you can even just place it on the dough to measure. Then, caaaarefulllyyyyyy place it into the pan/dish. I used kitchen scissors to trim the excess dough off the edge and then I just used my thumb to give the edge of the crust a nice little design. Do NOT throw away the excess dough. 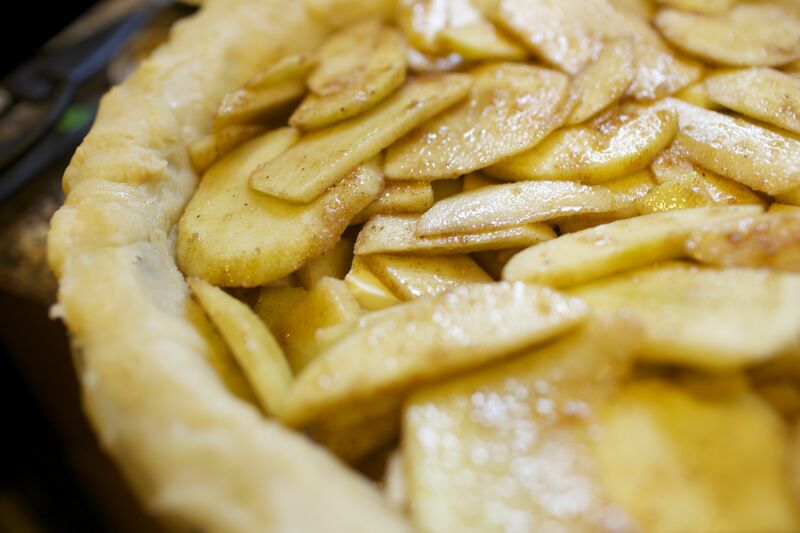 You can use it for something fun – a little tasty teaser before the pie is cooked. I’ll explain in a sec. Isn’t this fun!?!?! Heheheeee. I think so. Okay so now you’ll want to add the apples…a.k.a. pie filling. Sneak in some cubes of butter underneath the filling. 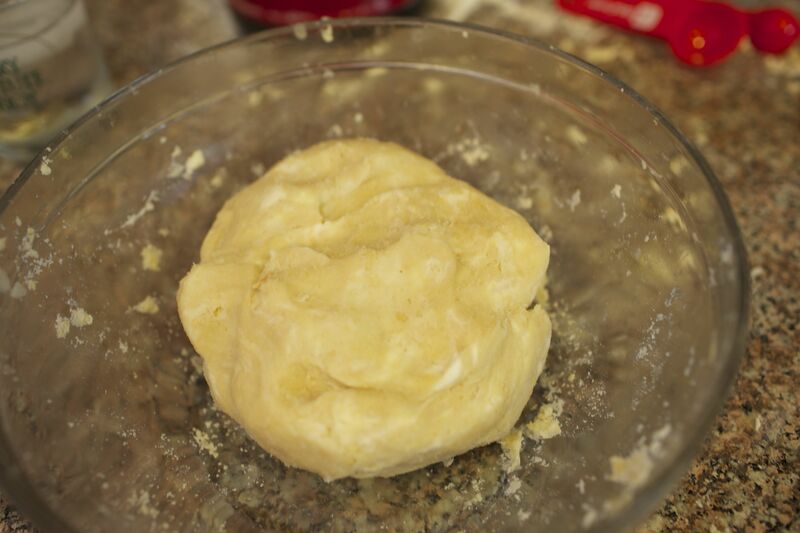 Roll out the second dough that you’ve reserved for the top of the pie. Once it’s large enough to add to the top…duh…add it to the top. Just be very careful to not break the dough while doing so. One trick is to carefully fold the dough in half so it’s easier to handle en-route to the pie, then unfolding on top of the pie. Same deal as in Step 6 – use kitchen scissors or a knife to remove the excess dough, and then pinch in the edges with your thumb to keep that nice design for the edge. Whisk up the egg and paint it over the pie to give the top a nice glazed look when it’s cooked. Then, sprinkle either white or brown sugar over the top to finish it off. Then…into the oven it goes!!! This will cook at 350 degrees for roughly 45 minutes on your middle-rack in the oven. Cooking time could be less time…could be more…totally depends on your oven and how crisp vs juicy you want the apples to be. You just have to watch it. Okay so while that cooks, it’s time to have some fun with that extra dough that I demanded you keep! I love this part. 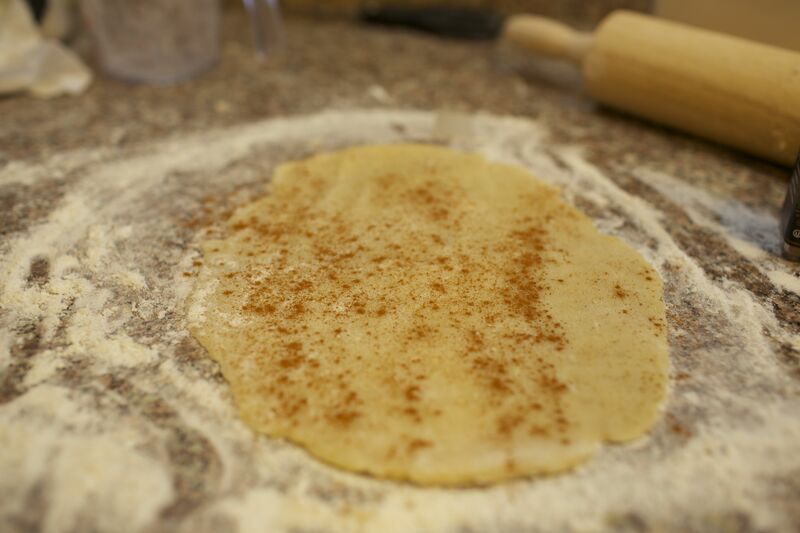 Roll it all out and drizzle brown sugar and cinnamon over the dough. Then, begin cutting out little thin pieces of dough as if you’re making cookies (I just used the rim of a water glass). 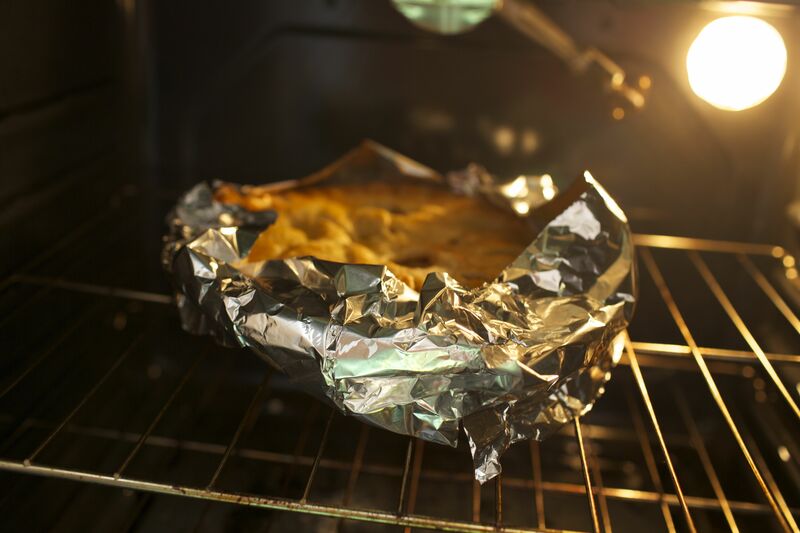 Place your slices on an un-greased cookie sheet and pop those bad boys on the upper rack of the oven, just above the pie. These little guys will cook really quickly – so keep an watchful eye on them and take them out just before they brown too much. Keep watching the pie as it cooks. It’ll begin to brown very quickly on the edges, so this is a good time to cover the edge with foil to keep it from burning while the rest of the pie still cooks. Amazingly delicious. Once it cools, top it off with some vanilla ice cream and enjoy to your heart’s content. I was so proud of my first apple pie and first homemade pie crust! Again, this was not my recipe. Just a fun little documentary of how it went. 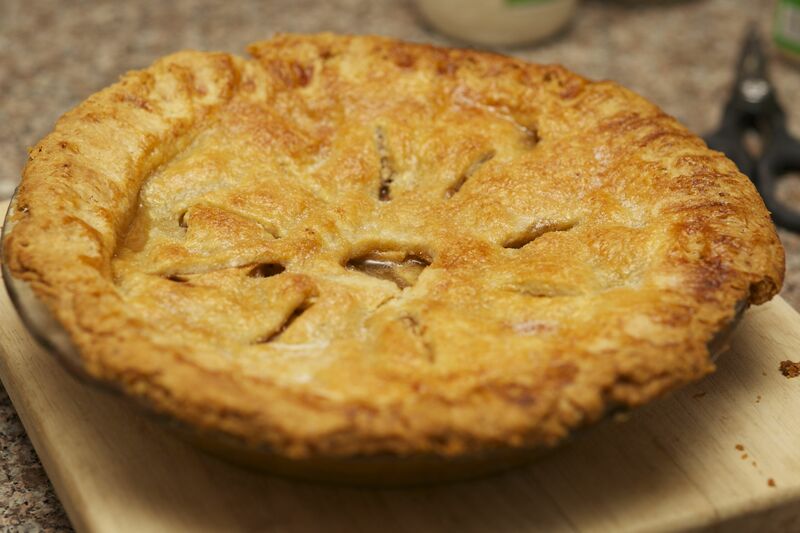 I know that it’s time consuming, but if there’s any season to devote a rainy Saturday or Sunday to making a homemade apple pie – this is the time! I hope it’s inspired you to make something delish! Let me know how yours turned out if you make one! I’d love to hear your recipe suggestions too.